Computers, telecommunications, and networks are a part of our lives, regardless of our age. They let us quickly and easily communicate as well as manage and organize aspects of our daily lives. Le Groupe Maurice’s residents have direct access to the benefits of the digital age right in their residences. SOFI is a computer-based tool that stores the medical information of all residents at Le Groupe Maurice’s residences. An electronic record of each resident’s health data can be accessed easily and at any time in only a few clicks, not only by the nurses and care attendants at the residence, but also by the physician and pharmacist. 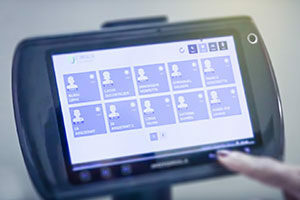 Computerization offers unparalleled security and peace of mind, while greatly improving the efficiency of our care staff and their ability to provide quality monitoring and assistance to all residents, regardless of their level of autonomy. To learn more about SOFI, read the blog article "Mieux connaître notre client grâce à SOFI", by France Morissette, Assistant Vice President Health, on the subject. With computers, tablets and cellphones, we are becoming more connected every day, and retirees are no exception. Seniors have an increasing need to stay connected, whether it be to surf the web, communicate with their loved ones and share their important moments, or look up information. This is why all of our residences have free Wi-Fi in the common areas. Each residence has free-use internet stations for residents in the common areas. Most of our residences also have computer clubs that offer a number of intro and advanced classes, particularly for tablets. In addition to our website, Le Groupe Maurice has a blog, online news section, and newsletter for residents and their loved ones. This allows families to also stay informed on recent news and upcoming projects. Our Facebook page is also a fantastic communication tool where we post updates about life at the residential complexes as well as daily photos, contests, games and testimonials, to be enjoyed by all on this popular platform. Check out our page at www.facebook.com/legroupemaurice !